North Korean leader Kim Jong-un on Wednesday invited President Moon Jae-in for another summit in Pyongyang on Sept. 18-20. Kim unexpectedly met with five senior South Korean officials in Pyongyang on Wednesday despite having been off the radar for two weeks. National security adviser Chung Eui-yong, who led the five-member delegation, told reporters here on Thursday morning that Kim "reaffirmed his willingness to keep his denuclearization pledge." 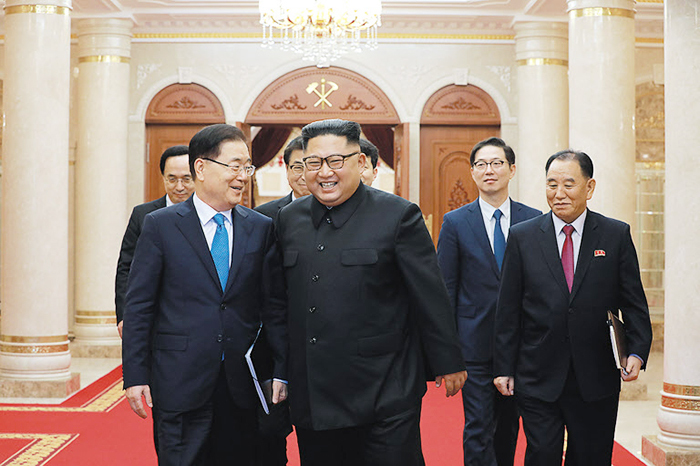 National security adviser Chung Eui-yong (left) and other South Korean officials walk with North Korean leader Kim Jong-un in Pyongyang on Wednesday. The trip seems to have gone better than expected. On arrival Chung handed a smiling Kim a letter from President Moon Jae-in detailing cross-border economic cooperation plans and urged North Korea to speed up denuclearization, according to Cheong Wa Dae. The officials arrived in Pyongyang at 9 a.m. and were driven to the Koryo Hotel, where they were greeted by Kim's right-hand man Kim Yong-chol and Ri Son-gwon, the chairman of the Committee for the Peaceful Reunification of the Fatherland. They then met with the North Korean leader to discuss the agenda of the upcoming inter-Korean summit and other matters. 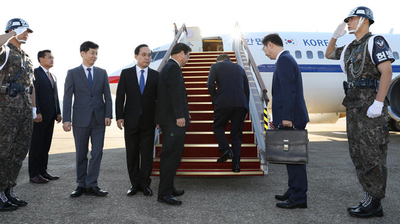 The delegates briefed Moon on their trip as soon as they returned to Seoul on Wednesday night. Chung told reporters before his trip that a draft statement about the opening of an inter-Korean liaison office in the shuttered Kaesong Industrial Complex had already been agreed.